Looking for a way to save space and increase your storage capacity while maintaining hygienic practices? 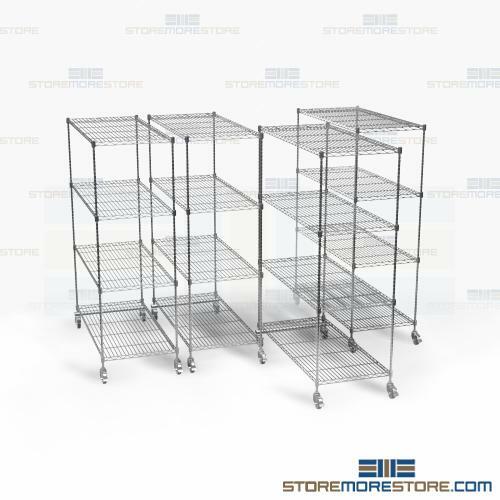 Wire pull-out shelving racks are a great way to achieve all of the above and more. Choose from antimicrobial, zinc, black and silver epoxy, chrome, or stainless steel finishes. Every finish is NSF listed to meet strict public health and safety standards. This makes them especially ideal for use in healthcare or food service applications, helping keep patients and customers safe. Shelves up to 48″ long can hold up to 800 lbs. Shelves 60″ and wider can hold up to 600 lbs. When choosing your finish, it’s important to consider your storage application and environment. For example, antimicrobial finishes are ideal for healthcare and food handling. Stainless steel is also durable and easy to clean for any storage application. Zinc also has an antimicrobial and electro-plated coating that resembles chrome but handles extreme temperatures and humidity. Meanwhile, black and silver epoxy finishes are great for general wet and dry storage. And when you want storage with a high-tech, glossy look, chrome is your best bet. Not sure which type of finish is best for your application? Send us a message on our live chat and we would be happy to help you decide. 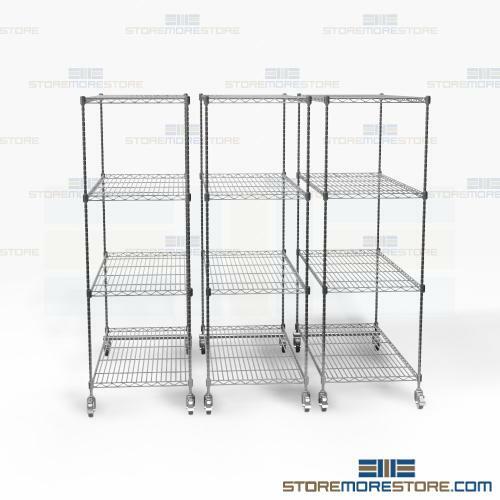 Wire pull-out shelving racks are available to buy online and ship in 5-7 business days with free dock-to-dock shipping included. If you need any assistance or just want some help picking the right solution for you, please call us at 1-855-786-7667.